When internal pressure is applied to thick cylinders it has been shown that maximum tensile stresses are set up at the inner surface of the bore. If the internal pressure is increased sufficiently, yielding of the cylinder material will take place at this position and the working safety factor n according to the Tresca theory will be given by oh -or = oy./n where aH and o> are the hoop and radial stresses at the bore. Fortunately, the condition is not too serious at this stage since there remains a considerable bulk of elastic material surrounding the yielded area which contains the resulting strains within reasonable limits. As the pressure is increased further, however, plastic penetration takes place deeper and deeper into the cylinder wall and eventually the whole cylinder will yield. Fatigue life of the cylinder will also be heavily dependent upon the value of the maximum tensile stress at the bore so that any measures which can be taken to reduce the level of this stress will be beneficial to successful operation of the cylinder. 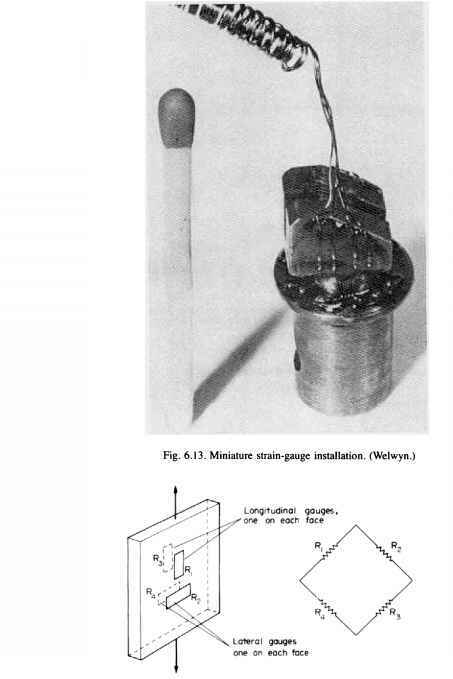 Such methods include the use of compound cylinders with force or shrink fits and/or external wire winding; the largest effect is obtained, however, with a process known as "autofrettage". If the pressure inside the cylinder is increased beyond the initial yield value so that plastic penetration occurs only partly into the cylinder wall then, on release of the pressure, the elastic zone attempts to return to its original dimensions but is prevented from doing so by the permanent deformation or "set" of the yielded material. The result is that residual stresses are introduced, the elastic material being held in a state of residual tension whilst the inside layers are brought into residual compression. On subsequent loading cycles, therefore, the cylinder is able to withstand a higher internal pressure since the compressive residual stress at the bore has to be overcome before this region begins to experience tensile stresses. The autofrettage process has the same effect as shrinking one tube over another without the complications of the shrinking process. With careful selection of cylinder dimensions and autofrettage pressure the resulting residual compressive stresses can significantly reduce or even totally eliminate tensile stresses which would otherwise be achieved at the bore under working conditions. As a result the fatigue life and the safety factor at the bore are considerably enhanced and for this reason gun barrels and other pressure vessels are often pre-stressed in this way prior to service. Care must be taken in the design process, however, since the autofrettage process introduces a secondary critical stress region at the position of the elastic/plastic interface of the autofrettage pressure loading condition. This will be discussed further below.